SUNDAY TO SUNDAY rental in season for your travel convenience. We also offer off season check-in on Saturday. Located oceanside in quiet, safe area on private lane. Less than 5-minute walk from front door to the ocean with no streets to cross! Wide white sand beaches with sparkling water. An added bonus is that it is less than 5-minute walk from front door to sound side as well! See the ocean from the second and third floor decks. Beautiful views of Cape Hatteras Wildlife Refuge. Decks are covered in several areas, so you can be outside even if it drizzles. The second floor deck gives you the option of sitting in the sun, sitting in the shade, sitting under a covered deck, or sitting on the screened porch. Dry entry under the house. Day-use park within walking distance on sound side perfect for kite boarding, paddle boarding, kayaking, and swimming for small children - water shallow and calm. Perfect for floaties. There is parking if you decide to drive, and they have a bath house. Like to run, ride a bike or just walk - awesome walking/bike path that goes for miles. Austin’s Seafood for freshest seafood caught locally just down Rt. 12. Waves Market and Deli has awesome sandwiches and sides along with specialty groceries and a candy shop. All local owned restaurants in town with friendly customer service. Local owned ice cream parlor and fruit stands. Live bands at Waterman's on the weekends. Terrific coffee shop at Kitty Hawk Kites. Either fish at the nearby pier in Rodanthe, fish in the surf, rent a charter boat for the sound, or go deep sea fishing. Climb the Hatteras Lighthouse, the tallest in North America, just 30 minutes south. Take the free ferry to Ocracoke Island to see wild horses, explore the quaint fishing village, or take a family bike tour. Or take the kids to the aquarium in Manteo. There is SO MUCH to do and see in the area. Avoid the development and bustle of the rest of the Outer Banks and come relax, swim in the ocean, and enjoy a week of gorgeous sunrises and sunsets. Casablanca is located adjacent to the exclusive South Beach Community of Salvo on the Cape Hatteras National Seashore. There are exquisite, unspoiled views of the Atlantic Ocean and Pamlico Sound unsurpassed by other areas. There are numerous ways to reach the beach from the house – via an established walking path, or over a wooden boardwalk, or even with your four-wheel drive vehicle (we are one tenth of a mile away from drivable access.) Any way you choose to walk, there is no highway to cross. This house is perfect for one family or two or three families vacationing together. Hatteras Island is one of the few places where you can build a fire on the beach (free permit required that you can download before you come-some available on the island if you forget) - something everyone will always remember. There is plenty of parking on the premises. Outside there is a hot/cold shower and covered fish cleaning station. There is a large lockable storage area as part of the house. The park size charcoal grill and picnic table are perfect for outdoor cooking. The first floor includes a bonus room with double futon, refrigerator with ice maker,wet bar, and microwave along with a game room that has a game/puzzle table and a foosball table. Also on this floor is a bedroom with two twin beds and a full bath. The washer/dryer is located in the hall. The second level has cathedral ceilings for an open, airy feeling. That’s where you’ll find the main living area with a great room, dining area, eat-in chef’s kitchen with bar, master queen bedroom, and full bath. The great room is equipped with a Flat screen HDTV, DVD, and CD. Enjoy the DVDs, books, magazines and games that we provide. This master bedroom has access to the deck that wraps around three sides of the second floor. There is a gate on the deck that can be locked to keep the young ones within sight. The bubbly hot tub is located on the southwest corner of the deck and adjoins the screened porch with furniture that runs the full length of the back of the house. Included in the price - Day of arrival and day of departure professional cleaning service and all bed linens. Hot tub is serviced on your day of arrival and mid week. A starter supply of amenities is provided at no charge to include paper towels, toilet paper, and several trash bags. This well maintained, clean home is PET and SMOKE free - strictly enforced. Our keyless entry system gets you started on vacation as soon as you arrive on the island. There is a service that can do food shopping for you and have it waiting in the refrigerators when you arrive if you like. Beds: 1 king, 1 queen, 4 singles, double futon, extra mattress. Click the "send email" button in the "Owner Box" on your right for answers to your questions. You must be 25 or older to rent this home. We do not provide towels. Bring your own, or rent them on the island. Our cancellation policy is in the rental agreement. THIS HOME IS COVERED UNDER THE NORTH CAROLINA VACATION RENTAL ACT. THE RIGHTS AND OBLIGATIONS OF THE PARTIES TO THIS AGREEMENT ARE DEFINED BY LAW AND INCLUDE UNIQUE PROVISIONS PERMITTING THE DISBURSEMENT OF RENT PRIOR TO TENANCY AND EXPEDITED EVICTION OF TENANTS. YOUR SIGNATURE ON THIS AGREEMENT, OR PAYMENT OF MONEY OR TAKING POSSESSION OF THE PROPERTY AFTER RECEIPT OF THE AGREEMENT, IS EVIDENCE OF YOUR ACCEPTANCE OF THE AGREEMENT AND YOUR INTENT TO USE THIS PROPERTY FOR A VACATION RENTAL. Daniel and I enjoy sharing good times with family and friends. We designed and built this beach house with love and care. We are grandparents to six beautiful girls. We wanted a place where the entire family can gather to celebrate one another in a stress free environment. Owning a beach house was a lifelong dream come true for us, and we are happy to share our beautiful home with you! We live an active lifestyle and love being around the water - fishing, kiteboarding, surfing, birding, beach combing, and just listening to the ocean. Salvo offers the best of everything on the Outer Banks. It is located in the tri-villages (a 5 mile stretch including Rodanthe, Waves and Salvo) surrounded by wildlife refuge. The beach is beautiful. The water stays warmer longer due to the Gulf current. After you cross the small double dune, you feel like you've arrived on a remote island - a real slice of paradise. We cannot remember a year that the beach was not high up on the best beach list for the country. We are close to the ocean and the sound, yet far from the hustle and bustle of many beachfront areas on the Outer Banks. You do not hear noise associated with many tourist areas. The wildlife and sheer beauty of time spent on the island leads to a unique vacation. Life here is slower paced so be prepared to unwind. View stars in the sky while soaking in the hot tub. The decks are spacious with plenty of seating - and you can always find a spot in the shade or the sun! The beach is great for volleyball, digging sandcastles, looking for ghost crabs, or just spreading out to enjoy the view. We are meticulous about maintenance, cleanliness, and keeping the decor bright, comfortable and inviting. 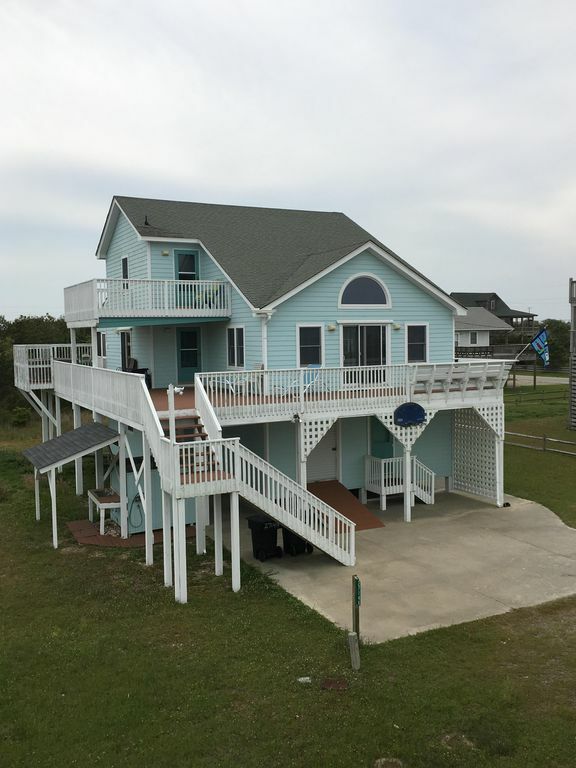 This home offers views of both the Atlantic Ocean and Pamlico Sound. There is parking for more than 5 cars on the premises. (2) One in the kitchen and one in the bonus room downstairs. We typically have two coffee makers on hand. We leave lots of spices at the beginning of the season for our guests to use. Plenty of dishes and extensive utensils. Well stocked with everything you need for cooking! There are two bar stools close to the main table that seats eight. There is a table and four chairs in the breakfast area. Table on screened porch has seating for ten. There is a television in every bedroom and in the great room. (5) Flat screens There is a television in the bonus room exclusively for videos. There are books that you are welcome to read and/or exchange! Things to take to the beach. Seating includes four chairs and four chaise loungers. Pool is located 11 miles south. There is a nominal fee to use the pool. The hot tub is serviced on your day of arrival and once during the week. Perfect place to vacation. Casablanca is a very comfortable, extremely clean and well equipped home. If you are a beach lover, this is the place to go. We absolutely loved our stay at Casablanca! We stayed week of August 26th 2018. It was perfect weather and not crowded at all... Excellent for beach time. Casablanca is very comfortable and kid friendly. The owners made sure all our needs were met. This home is well stocked with kitchen equipment/ supplies, beach gear and more. The town of Salvo is lovely. There are several local restaurants with great food and atmosphere. People are helpful and friendly. We would highly recommend staying here to anyone for their next vacation. Thank you for sharing your home with us!! This was our second year at this house in Salvo. We went back because of the location, layout, cleanliness, and price. It is a few minutes walk to the beach, and an easy drive to the sound. We love that you can walk to the Pea Island Art Gallery too! The layout was great- spacious enough for two kids, two grandparents, and us! The house is updated, completely stocked, and very clean! The owners are very responsive and so nice to deal with. Highly recommend. Let us know if you need a different payment plan. Flexible check-in day during the off season. Returning guests receive a discount. Just remind us. Also, if you would like to purchase damage protection through the website, we can accommodate that at the rate of $79. Please consider travel insurance. There are many options available to choose.